Indian Super League side Bengaluru FC on Thursday, announced the appointment of AFC Pro-Licensed Coach Naushad Moosa as Indian Assistant Coach for the first team as well as Head Coach of the newly formed BFC reserve side. Moosa has formerly served as Head of Youth Development and Head Coach of the U19 side at Pune FC and was head coach of Air India Limited in 2012. A former youth Coach at Mumbai FC, his most recent appointment was as U14s coach at Reliance Foundation Young Champs. “As a coach, it is a privilege to join a club that has a winning mentality. Bengaluru FC has won a trophy in each of its four seasons and the professionalism of this team is second to none. I’m really looking forward to being a part of the setup here,” said Moosa following his appointment. A former footballer himself, Moosa has turned out for Air India, Churchill Brothers, East Bengal FC, Mahindra United and Mohammedan Sporting in a career that spanned over 12 years. As coach of the Pune FC U19s, Moosa claimed the U18 I-League twice in three years and won the Pune League in 2016. “We are very happy to add Naushad to our backroom staff. His experience as a player and coach will add a lot of value to our team and the added responsibility of managing the reserve squad will see him nurture the future stars at BFC,” said club COO Mustafa Ghouse. 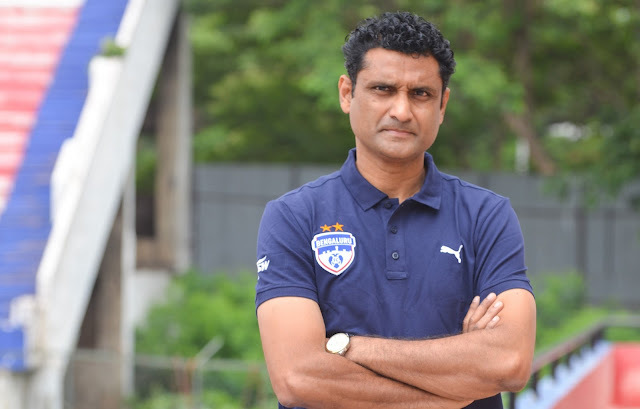 While joining Albert Roca and Carles Cuadrat as the Blues’ first team coaches, 46-year-old Moosa will also be at the helm of things for the newly formed BFC reserve side, which looks to bridge the gap between the clubs Residential Youth Academy in Bellary and the first team.